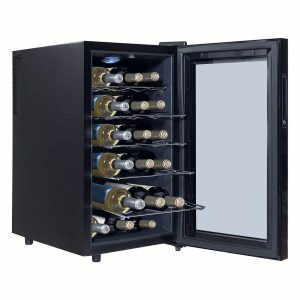 The 2018 brand new release black CostWay Thermoelectric Wine Cooler with a modern standalone design and high quality build is offered in three sizes and capacities of 6, 12 and 18 standard sized Bordeaux type bottles. All three are compact in size, run quietly and can be used in any part of your house including the kitchen, bar, or dining room, as they won’t disturb your conversation or sleep. And they have a both modern and classic design and are easy on the eyes with the glass see-thru door and the lovely black cabinet. 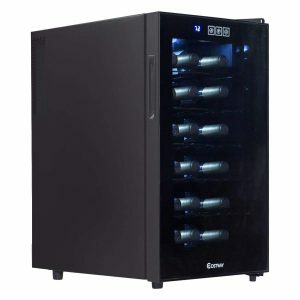 The small 6-bottle wine cooler can be put under the counter, on the table or on the floor, giving you a bit of flexibility. There is a touch control LED-backlit digital display panel with temperature up and down and light buttons as well as the temperature screen in Fahrenheit. You can select between Celsius and Fahrenheit. It is easy to operate and change the interior temp or turn on and off the light by pressing the simple touch buttons. The 6-bottle version scored 4.3 out of 5 stars by 17 customers, the 12-bottle is 5 stars by 11 customers and the largest 18-bottle is 5 stars by 6 customers. Price differences are not huge, especially not between the larger two models. So you may want to pay only 15 dollars more (at the time of this review) to get the 18-bottle cooler rather than the 12-bottle. You can see your bottles and pick one before opening the door through the glass transparent door and the cool blue interior light that illuminates your bottles and show them off nicely. And you can easily open the door by holding the recessed handle. There are two adjustable steel shelves in the 6-bottle fridge and five steel shelves in the 12-bottle and the 18-bottle models. They are quite sturdy and slide out easily and can be removed for storing larger or different shaped bottles. You can also take them out for easy cleaning. Thermoelectric coolers are good for use in reliable climate-controlled spaces. If you won’t be keeping the cooler in such an area you may want to go for a compressor type cooler. These are efficient thermoelectric coolers with 50W power (70W for the 18-bottle) that consume lower energy. With the low noise and low vibration the sediments in your wine bottle will not be disturbed. The temperature can be set between 46 and 64 degrees in the 6-bottle 0.6 cubic feet capacity fridge, and 54 to 64 degrees in the 12-bottle 1.2 cubic feet and 18-bottle 1.8 cubic feet capacity units. Temperature goes down to what you set it to (temp is accurate) and cool your bottles efficiently. They run very quietly with a very low humming noise. There is no lock on these coolers to protect your wines from your kids. They do the job well, run quietly, look good and have relatively low price tags for what they are. Overall they offer very decent value for money.